Sources for details of the Forest Protection Limited (FPL) / Department of Natural Resources (DNR) come from both organization’s annual reports. Additional details come from an unpublished draft report to FPL by William Seto, A History of Forest Protection Limited (1952 – 1992): To Protect the Forests (Seto 1995). Hazel Clare, wife of Harold Hawes, sent me a summary of her husband’s time flying TBMs for FPL from 1962 to 1970, based on his log books [see the comment on the pilots page]. Details are below, although they sometimes disagree with the information presented. “The budworm control operation for 1958 was concentrated on 1.05 million ha of forests between the Saint John and upper Miramichi region.” It was such a great success that “forest experts believed it would be unnecessary to treat areas the following year as the outbreak had collapsed” (Seto 1995). The 1958 operations included 850,000 acres of new high hazard forest in New Brunswick. Spraying began out of Fredericton on June 1 with 12 Avengers. They started cautiously, with the weather not very favourable. As soon as Juniper opened up, four Avengers moved north to that field. One Avenger pilot, Thomas Marston, was killed when his aircraft crashed and burned twenty miles southwest of Juniper during evening spraying on June 12. Operations in Quebec lasted from June 9 until June 30, costing nearly $750,000 – $2.29/ha. A total of 26 aircraft treated 283,000 ha from Rimouski, Gaspe, Pabos, Farm Lake [all Quebec] and Charlo [New Brunswick] airstrips (Seto 1995). In 1958, Maine began its second budworm program, covering about 122,000 ha in Aroostook County. Instead of supplying airplanes, FPL supplied Maine with 1.14 million litres of DDT and assisted in a consulting capacity. Applications in Maine were made by Simsbury Flying Services of Connecticut with a fleet of eight TBMs and two Stearmans (Seto 1995). This was the first year that TBMs operated in New Brunswick. A brief report from the FPL files, (Wheeler Air Lines Ltd.: Operation Budworm – 1958: Aircraft and Pilots) lists 12 TBMs, 6 plus a spare (untanked) from Wheeler and 6 from Skyway Air Services. (Seventy-six Stearmans also were part of the operation.) The report has been annotated by former FPL employee Don Henry (his annotations are in square brackets below). Wheeler and Skyway TBMs that flew in New Brunswick in 1958 for the aerial spray program. Red entries indicate aircraft that crashed. The Avengers are being converted by Fairey Aviation of Dartmouth, Nova Scotia, and will be ready by May 15. The first two will be ready for delivery by this date. All aircraft will be in first class condition with valid Certificates of Airworthiness. Each Avenger will be fitted with radio sets comprising a V.H.F. ARC-1 Transceiver and a Pye Transceiver. The six Skyway Avengers will be subject to inspection at Fredericton, NB, by the Department of Transportation (federal) and by Wheeler Airlines prior to their acceptance on the project. Wheeler Airlines will supply the following personnel: Chief Engineer (Eddy Austin), three licensed Air Engineers, and twenty mechanics, procured on a temporary basis from the Royal Canadian Navy and the Royal Canadian Air Force. The Operations Manager will be George Lovett and the Managing Director is Bob Rychlicki. Skyways will provide 2 licensed engineers and six mechanics, overseen by Chief Project Engineer Eddy Austin, who will be responsible for all maintenance activities. Wheeler will have a spare Avenger, CF-IMU, which will be used as a flying spare should trouble develop in any of the other Avenger aircraft. 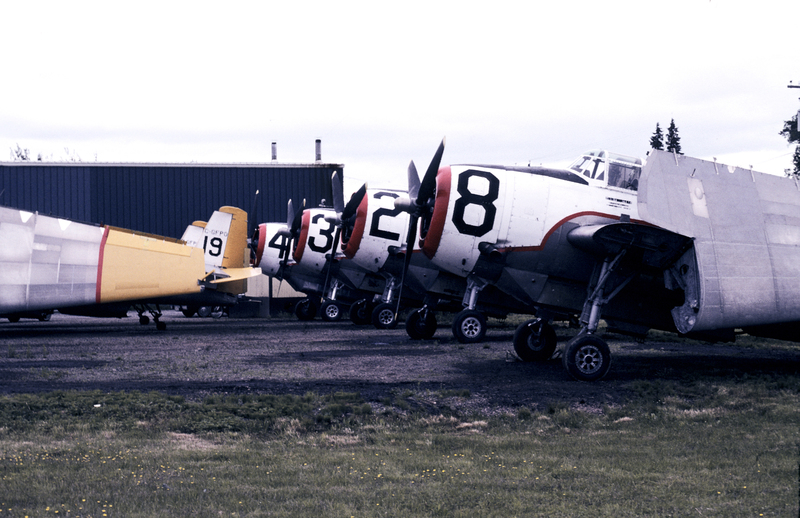 Wheeler (yellow) and Skyway Avengers at Fredericton Airport, 1958. It was such a great success that “forest experts believed it would be unnecessary to treat areas the following year as the outbreak had collapsed” (Seto 1995). Thus FPL did not conduct any operations in 1959. The 1960 operation began on May 26 and lasted until June 20. Twenty TBMs were flown. FIMS (Wheeler #502) flew in NB in 1960. It crashed in Quebec 21 June 1960 while on the way from Dunphy airstrip to Quebec after finishing the FPL project for the season. [Don Henry] The same Wheeler and Skyway Avengers probably flew in New Brunswick this year. In Maine, and area of 175,000 acres was covered with a spray fleet of six TBMs and one Stearman. 24 TBMs flown. A two-page FPL report titled “1961 Spray Project” and dated March 12, 1962, listed the contractors, with details of gallons sprayed and money paid out. We have reason to suspect that these five companies were the ones that provided Avengers, although Wheeler also provided Stearmans. However, no numbers are given and no aircraft are identified. I speculate below about the number belonging to each contractor. Simsbury had purchased three TBMs from the RCN in 1958 (later sold to Maritime Air Services), so I suspect that there were three Simsbury TBMs in NB in 1961. We know that Richel Air of Quebec purchased the two high-top Avengers from the RCN, so that makes two for them. However, of Airspray’s two Avengers, FKYA crashed in New Brunswick in 1960 and there is no record of its sister aircraft, FKPJ, ever coming to NB. Perhaps it did? According to an article in Wings (online) [(Position Report: Vintage planes dousing flames. A position report on Air Spray. Wings)], Airspray’s fleet now included “a trio” of Avengers. Syme, Clarence “Clare”, Abbotsford, B.C. A new aerial spray method. 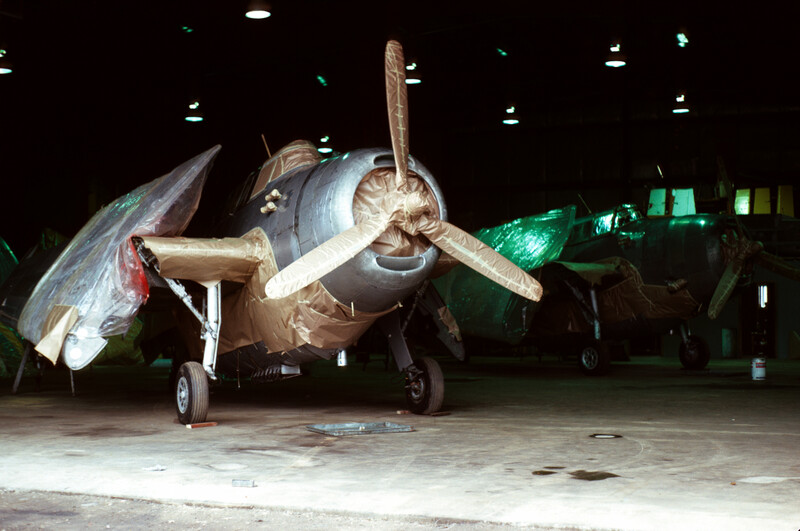 In 1961 FPL developed an “aerial flagging” method of guiding its TBM-3E aircraft over spray blocks. Cessna aircraft were positioned ahead of the spray aircraft and acted as a flag post marking each line. The system used teams of four TBMs and 2 Cessnas [Flieger 1964]. This was the first aerial flagging system to be used for the guidance of spray aircraft. To accommodate the larger, faster TBM, spray blocks changed shape from irregular boundaries averaging 18 square km to square boundaries of 56 square km. He began flying TBM’s in early May 1962 with familiarization and practice drops in Abbotsford on KCL then on May 19 headed for Dunphy with IMM, arriving there on May 22. It seems he sprayed around Dunphy with IMM until the end of June then took the machine back to Abbotsford/Smithers area to do some fire bombing. Skyway probably had 16 TBMs flying in 1962. If all five Wheeler TBMs joined the spray team this year, then nine of the 16 Skyway TBMs would have flown in from British Columbia for the project, but which ones they were is not known to this author. Six TBMs flown, probably a combination of Skyway and Wheeler aircraft. At the start of the spray season, Wheeler had 4 TBMs remaining and Skyway had 16. Wheeler’s CF-IMT (#503) had crashed on May 2, 1963, so was not available for the spray season. Possibly J.D. Irving’s CF-IMO (#508) was used this year, making five TBMs. Only one TBM from Skyway was thus needed, but I do not have any confirmation of this speculation. In 1963 he was back spraying again in Dunphy this time with IMV. In early July ’63 however he flew KCL out to Prince George for fire bombing and used both KCL and MUD for that purpose. Norm Ralston of Oregon sent me several images and files from when his dad, “Swede” Ralston and partner Ed Ball were pilot/owners of TBMs that sprayed spruce budworm in the 1950s and 1960s. From this I found evidence of a spruce budworm spray project in Maine that took place from 4 to 9 June of 1963. The project was based out of Presque Isle, which is just a few miles from the New Brunswick border west of Perth-Andover. From the personnel list we can glean that the following pilots and companies flew TBMs (Stearmans were also present) from this project, and that perhaps also worked in New Brunswick. Mechanics for each company were also present. No information on pilots and teams. Of the 28 TBMs flown, 5 were from Wheeler Airlines, 9 were from the U.S. company Johnson Flying Service and 14 were from Skyway Air Services (their entire remaining fleet). Wheeler was the contractor for their own aircraft and for the Johnson aircraft while Skyway dealt directly with FPL. The J.D. 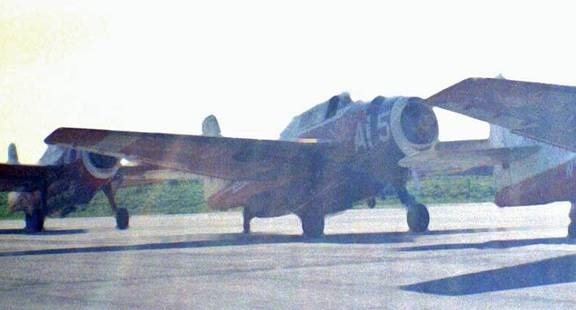 Irving TBM, #508 CF-IMO, is often lumped in with the Wheeler aircraft. 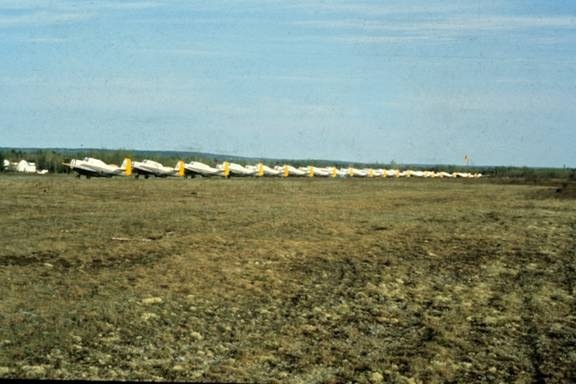 Spruce budworm spray operation at Dunphy airstrip, Blackville, N.B., 1964. Bruce Atkinson photo. Posted on New Brunswick Aviation Museum fb page on July 21, 2015. The two Skyway TBMs at right are CF-KCH and CF-KCL. In the 1964 season he went to Dunphy spraying again, this time on KCH then on June 27 flew KCH with Pete Deck as passenger to Kapuskasing. The months of July & Aug. of ’64 he was fire bombing and practicing same in Smithers again with KCH. No information on pilots and teams, although there is an FPL report titled “Aerial Forest Spraying Operations 1965” by B.W. Flieger dated November 1965. 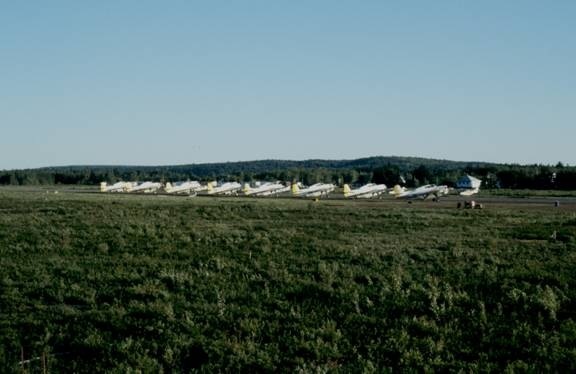 A total of 19 TBMs flew out of Fredericton Airport and Juniper and Dunphy airstrips. Probably the same 14 Skyway Avengers and others from 1964 flew again in 1965. 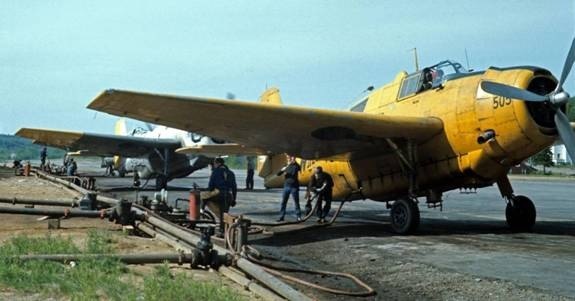 There were special preparations for the spraying of Phosphamidon in experimental areas, but this was done from Dunphy airstrip from the side opposite from the DDT storage to keep the work separated from the spraying of DDT. Four TBMs were brought in early so they could be calibrated for this experimental spray. The summer of 1965 he sprayed in Juniper with IMM then in July went fire bombing in Kamloops with KCF until the end of that season. A report from the FPL files, “Forest Protection Limited 1966 Project Report on Aircraft Calibration” by R.E. (Rudy) Hanusiak, lists the following 22 TBMs and pilots from the following: Wheeler Airlines (5), JD Irving (1), Johnson Flying Service (2), Skyway Air Services (14). On May 22, 1966 he flew KCH back from Abbotsford to Juniper and used it for spraying around Dunphy/Juniper area. He ended that season with a short flight from Dunphy to Fredericton in MUD on June 19. TBM spray aircraft and pilots in New Brunswick in 1966 for the aerial spray program. Red entries indicate aircraft that crashed. A report from the FPL files, Forest Protection Limited “1967 Project Report on Aircraft Calibration” by R.E. (Rudy) Hanusiak, lists the following 13 TBMs and pilots: Wheeler Airlines (3 plus the JD Irving TBM), Skyway Air Services (9). TBM spray aircraft and pilots in New Brunswick in 1967 for the aerial spray program. 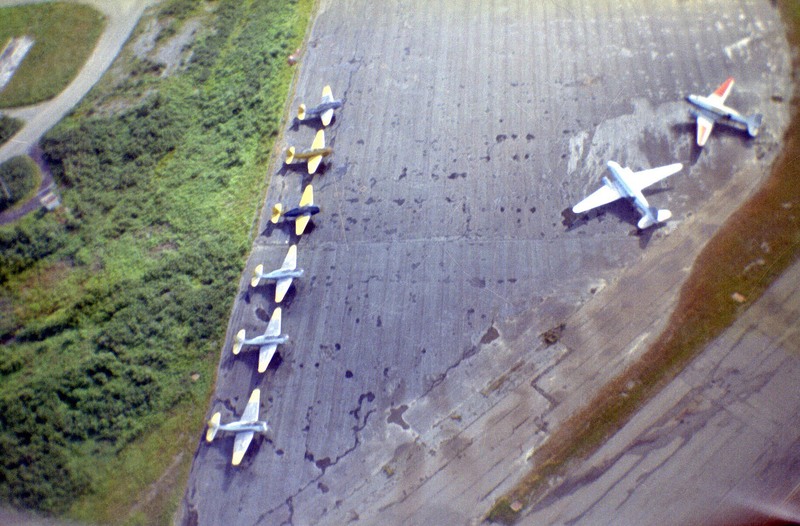 The Skyway TBM fleet (9 aircraft) at Dunphy Airstrip, 1967. Skyway TBMs #605 FIMN, #604 FIMM and #618 FMUE, probably one of the teams used that year, and an unknown TBM, 1967. Wheeler Northland #505 in pits at Dunphy, 1967. The other two TBMs in the team belong to Skyway Air Services of Langley, BC. Six TBMs flew in two teams (no info on pilots) in New Brunswick in 1968 (Source: FPL files). FPL also agreed to act as an agent for the Province of Newfoundland and Labrador for a forest spraying project in July against the Hemlock Looper. FPL files say that 7 TBM flew this year. Possibly an additional aircraft helped out in the Newfoundland project, although it is not mentioned in the 1968 report. He did not fly TBM’s in 1967 but started again in 1968. On May 22, ‘68 he set out with IMM again from Abbotsford to Dunphy and sprayed with it around Dunphy [NB], [and] St. John[‘s?] [and] Stephenville [NF] until the end of July of that year. 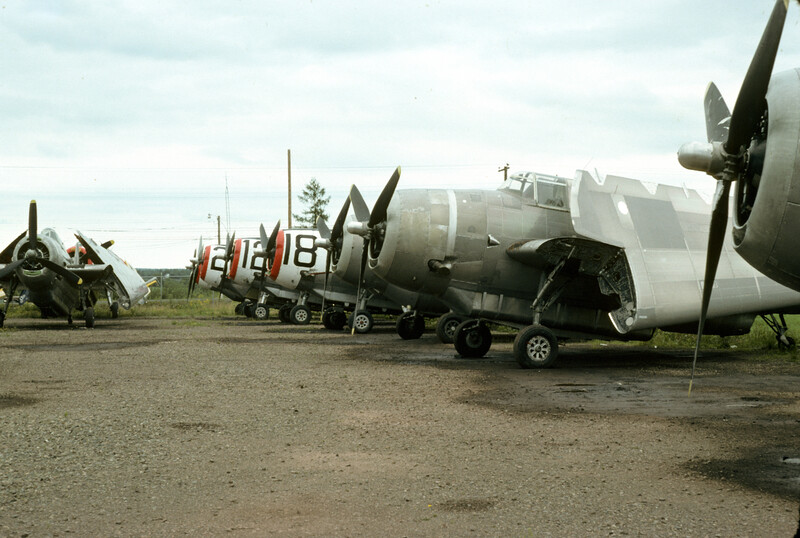 TBMs that flew in New Brunswick in 1968 for the aerial spray program. Team positions and pilots were not recorded in the information that I have. Table VII from the 1969 FPL report “1969 Spray Operations” lists 26 TBMs used in the 1969 New Brunswick spray season. A photocopied handwritten table from the FPL files supplied by Don Henry lists 8 teams of TBMs and their pilots, including those from Conair Aviation (13), Wheeler-Northland (5), Maritime Air Service (3), Central (1), Richardson Aviation (1), Johnson Flying Service (3). The entire fleet operated out of three airfields in New Brunswick: Chipman, Dunphy and Juniper. TBMs that flew in New Brunswick and Newfoundland in 1969 for the aerial spray program. Red entries indicate aircraft that crashed. #602 is listed twice. Some of the aircraft known to have operated in Newfoundland are denoted by NF and all of those in New Brunswick by NB. Billy Goat team at Dunphy, NB, 1969. From left to right (in front): #D6 N9597C, #A15 N3251G and #A11 N7114C. Rear: The two yellow and black aircraft, one in the last row and one way at the back, are N7031C (Airway #111) and N7032C (Richardson #112), but which one is which cannot be determined. Runway: very likely Maritime Air Service #900 FXOM (right) and #911 FXON. TBMs at Gander Airport, Newfoundland, July 1969. Appendix V from the 1970 FPL report “Forest Spraying Operations – 1970” lists the TBMs used in the 1970 spray season by aircraft project number; it is in fact the same list as used in 1969 with a note at the bottom saying “this prescription is for 1970”. The 1970 hand-written calibration list and two photocopied handwritten tables from the FPL files supplied by Don Henry (which lists 9 teams of TBMs and their pilots) include three additional TBMs (#110, #A14, #56) for a total of 27. JD Irving’s TBM #508 FIMO was also present. In 1970 (May 23rd) he flew IMX from St. Jean to Dunphy to start the spraying season. There is a short flight noted in his log from Dunphy to Chipman on May 23, then on what looks like May 28th he lost control while taking off from a muddy strip and bent up the prop on IMX. That apparently ended the spraying season for him and for that matter he never flew TBM’s again after that. 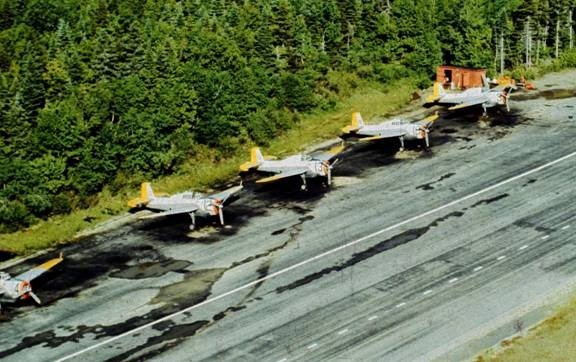 TBMs that flew in New Brunswick and Newfoundland in 1969 for the aerial spray program. Red entries indicate aircraft that crashed. The Whiskey Team: Conair TBMs #609 FKCL, #601 FIMI and #602 FIMK in formation, 1970. 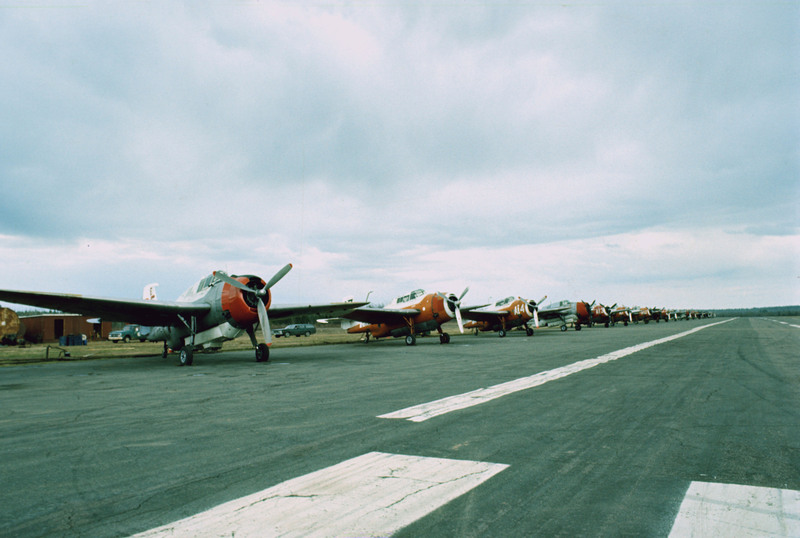 The Nylon team, Dunphy airstrip, 1970: Conair TBM #617, Reeder TBM #56 N7076C (left) and Norfolk TBM #58 FAYL (in back). 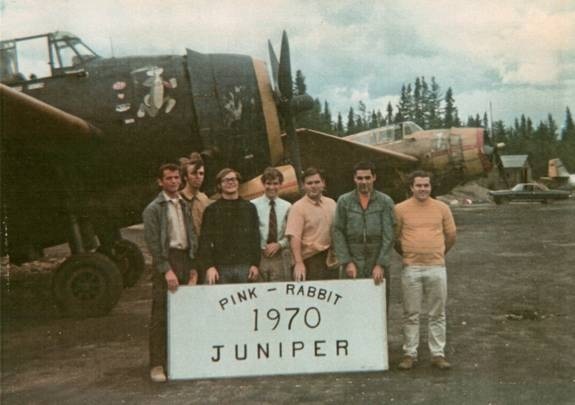 The Pink (pointers) – Rabbit (TBMs) team at Juniper airstrip, 1970. Maritime Air Services TBM #911 FXON is in front, with MAS TBM #900 FXOM at rear. The tail of the other member of the team, Wheeler FIMW #506, can be seen at far right. L to R: Joe Gagne (Cessna #1 pilot), Doug Johnson (pointer #1), Dave Scott (pointer #2), Jim Thompson (Cessna #2 pilot), Claude Marcoux (Lead TBM FIMW pilot), John Lavigne (#3 TBM FXON pilot), Barry Paton (#2 TBM FXOM pilot). It was pilot Lavigne who painted the Bugs Bunny cartoons on the three TBMs. Sources were two handwritten team and pilot lists provided from the FPL files by Don Henry; one dated 12 June 1971 (one page) and the other (two pages) undated. Some of the teams differed between the two lists, indicating that conditions and personnel were certainly changeable. Another source was a table entitled “N.B. 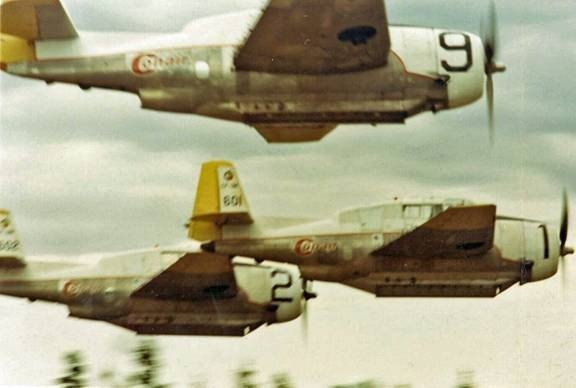 & Quebec Spruce Budworm Projects: United States Registered Grumman TBM-3 Aircraft – 1971”, compiled by Evergreen Air Service Ltd.
A total of 20 Canadian and 25 US TBMs were contracted to fly in NB and Quebec. Air Tankers’ TBM #B14 N9599C was contracted to spray in NB but crashed in Iowa on 20 May 1971 before arriving; a BC TBM also crashed on the outward ferry and returned to BC. In 1971 mixing plants and aircraft were based at Maniwaki, Lacs-des-Loups, and a bush airstrip built near Lac Nilgaut, in Western Quebec, specifically the extensive Gatineau area north of Ottawa, Ontario, and Montreal, Quebec. Forest Protection Limited conducted the operation. Nine TBMs were divided into three teams and assigned to each airport/airstrip, and were to spray 2 million acres. To speed up the operation, a fourth team was added from New Brunswick during the last five days. TBMs were used exclusively in 1971 (June 11-12) in the Temiscouata region, which is located near the northwest border of New Brunswick. The program was conducted by Forest Protection Limited using TBMs based in Edmundston, NB. TBMs that flew in New Brunswick in 1971 for the aerial spray program. Source: List 1 dated 12 June 1971. Those that appear on List 2 (an earlier or later list) are marked with an X under the team column. Red entries indicate aircraft that crashed. Hemet Valley Flying Service TBMs #E52 N9434Z and #E72 N3357G (in back), part of the Ringtail team, Dunphy airstrip, 1971. Sources for TBM teams and pilots are five handwritten and typed lists provided by Don Henry from the FPL files. Most are working copies and have deletions and amendments showing changes in teams, pointers and pilots. I have attempted to combine them into one table that shows the distribution of TBM teams across projects in NB, Quebec and Maine. Some aircraft show up more than once because of their assignments to different teams and projects. 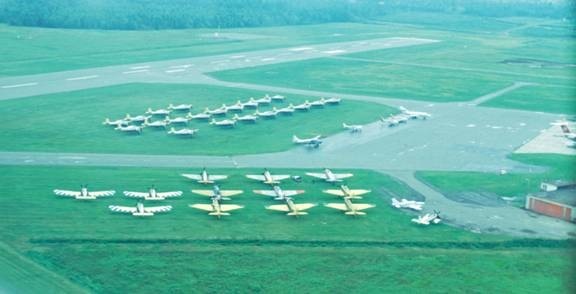 The total number of TBMs in the sprayer fleet was 44, and all were calibrated in New Brunswick at Dunphy Airstrip. Twenty-four TBMs began work from five fields in NB, concentrated in the early days from from Sussex and Blissville and gradually moving to Juniper and Sevogle where most were working during the last week. Dunphy had a small number working throughout the season. Experimental B.t. 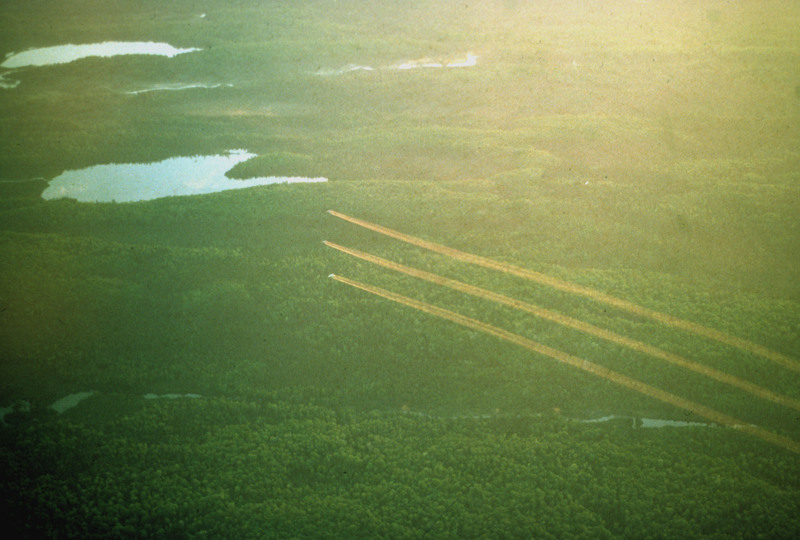 trials concerning spruce budworm were conducted in western Quebec by a fleet of 18 TBMs with boom-and-nozzle and associated guidance aircraft. Western Quebec comprises the extensive Gatineau area north of Ottawa, Ontario, and Montreal, Quebec. TBMs were also used to spray jack-pine budworm based at Lacs-des-Loups airport, Quebec. 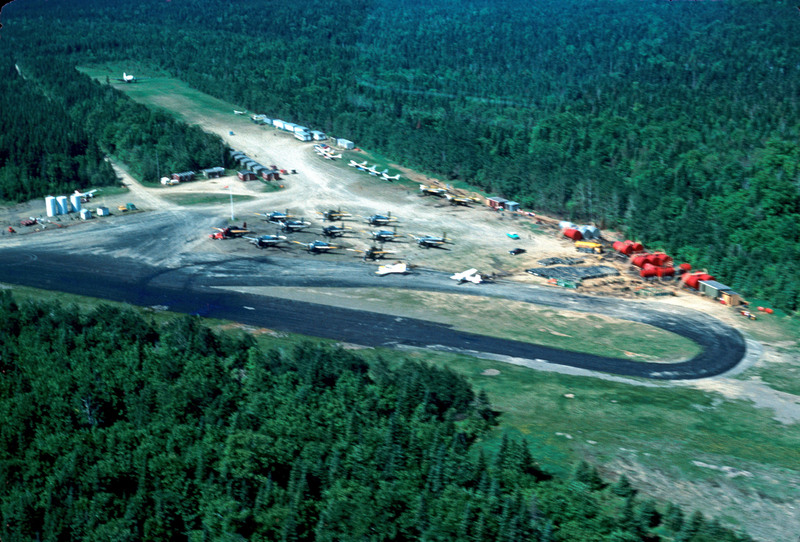 Anticosti Island, a large Quebec island situated in the Gulf of Saint Lawrence between the Gaspe Peninsula and Newfoundland, suffered a hemlock looper infestation and was sprayed in 1972 and 1973. Spraying operations were conducted by FPL using 15 TBMs in 1972 and other aircraft in 1973; these were based at Port Menier airport. 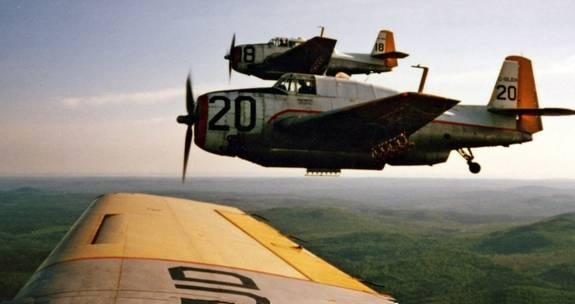 Spraying in Maine was conducted by a fleet of three TBMs and 10 PV2s. 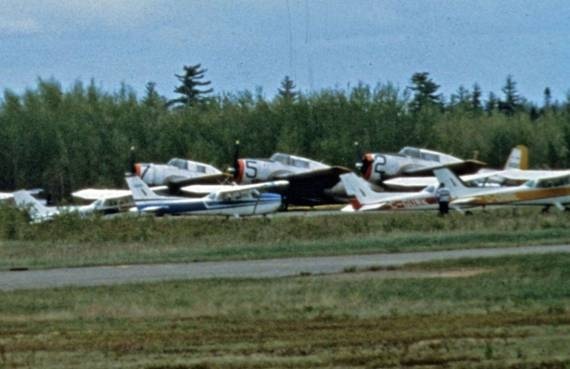 TBM teams that flew in New Brunswick (and Quebec and Maine) in 1972 for the aerial spray program. Quebec: TBMs flew out of Manawaki and Lac des Loups. Quebec locations (√) also included Anticosti Island for a Hemlock Looper project (√ A). Red entries indicate aircraft that crashed. Merrill McBride in the cockpit of FZTS #A23, 1972. Louis Sytsma (2011) Reply to a comment posted to the FAYL page: Boy this brings back some old memories. I was the pilot who flew AYL in 71-72. After that I flew for Irving Oil. I was in the area when Merrill McBride went down. That was a very sad day. I knew Merrill since he looked after AYL maintenance in 71. He was a real fine person. Dec 2, 1972 CF-BEG – Test flight – Simsbury – No gen, flap or U/C indicators. Fuel will not feed from C. main, lost part of canopy in flight, aileron trim broke loose causing severe vibration. Nice trip. June 6, 1973 – CF-ZTA – Spray block #1 – Came home with rough engine. Donkey 3, John Prast, lost engine on T.O., stalled into trees, complete write-off [CF-ZTS]. Cracked vertebrae and ankle. Sources for the list of pilots and teams include a typewritten list from Conair dated May 1973 showing their planned teams and a handwritten and annotated list from FPL. Adult budworm moths were sprayed in 1973 in the St. Leonard and St. Quentin areas of northern NB by TBMs equipped with boom-and-flat-fan nozzles. TBMs were used exclusively in 1973 (June 6) in the Temiscouata region, which is located near the northwest border of New Brunswick. The program was conducted by Forest Protection Limited using TBMs based in Edmundston, NB. 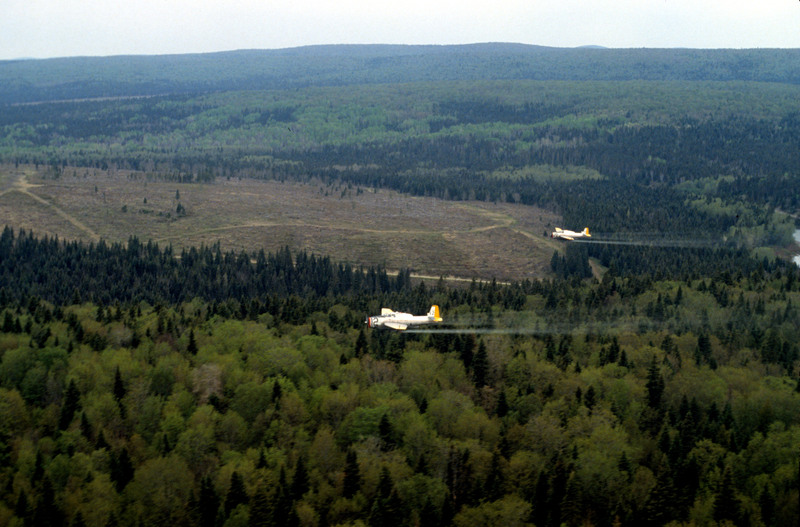 In 1973, spraying was conducted by three Conair Aviation TBMs and two Canadair CL-215 water bombers owned by the Quebec Department of Transport. The Avenger’s capacity was increased slightly and the boom-and-nozzle assembly was moved above the wings, resulting in a wider spray swath (½ vs. ¼ mile). Further, an experimental B.t. spray was conducted by TBM and CL-215 aircraft equipped with boom-and-nozzle. There was no spraying by FPL in Quebec as that province undertook its spray program without FPL assistance. Total number of TBMs was 18, with one spare, the same as in 1972 except for the following (Flieger letter to Air Transport Committee). The most significant change was Conair, which dropped to 7 from 13. This was the first year that the number of TBMs available in Canada exceeded the New Brunswick spruce budworm requirement, and thus was the last year that US TBMs flew in NB, until 1981 and 1982. 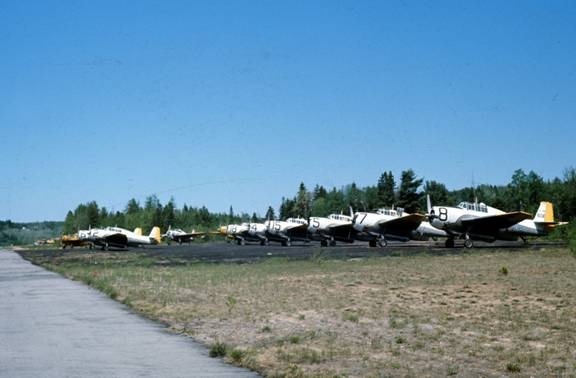 TBM teams that flew in New Brunswick in 1973 for the aerial spray program. Red entries indicate aircraft that crashed. The spare, TBM #18, replaced #A23 in the Donkey Team after it was destroyed in a crash in June. Sources for the list of pilots and teams include two handwritten and annotated lists from FPL, referred to below as 1 and 2 after the team name. The first listed 6 teams that were planned for the season. The second list dropped the Jughead and Ping Pong teams after crashes resulted in the loss of 4 Avengers and the redistribution of pilots and aircraft but listed one (#716) that crashed later. 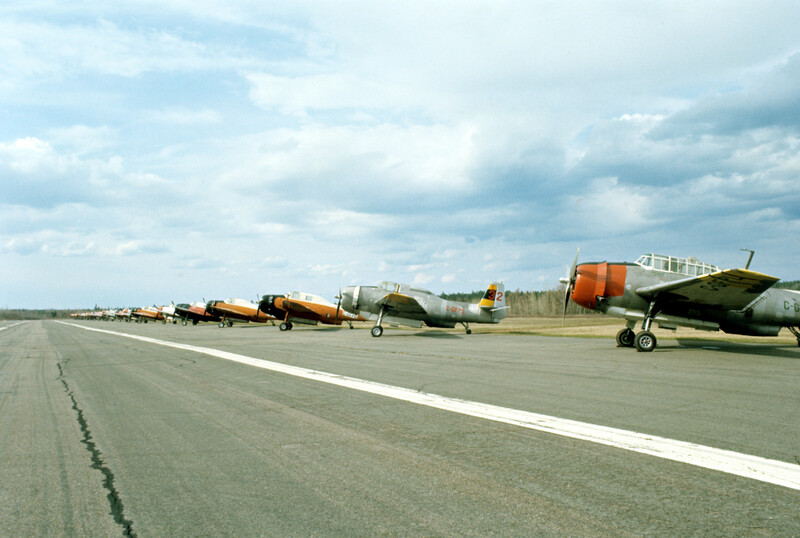 TBM teams that flew in New Brunswick in 1974 for the aerial spray program. Red entries indicate aircraft that crashed. Text in italics indicates teams on second list. Sources for this list of pilots and teams are the 1975 FPL Annual Report and a handwritten and annotated list from FPL. FPL “dry leased” its aircraft to Evergreen Air Services, which operated them under contract, as FPL was not yet a licensed aircraft operator. A total of 32 TBMs were operated in NB during the spray program. The 1975 annual report was the first of a series of much more detailed reports that described every aspect of FPL and its operations, spearheaded by new General Manager H.J. “Bud” Irving. 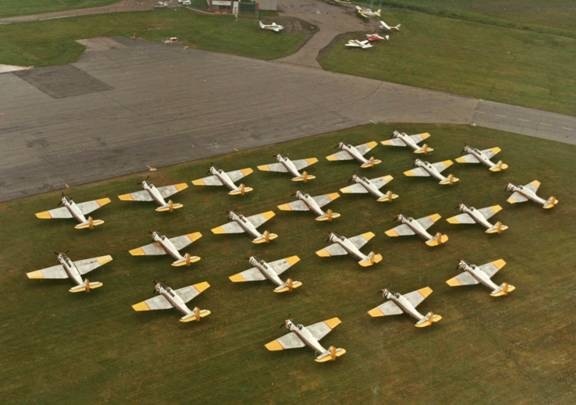 TBM teams that flew in New Brunswick in 1975 for the aerial spray program. Red entries indicate aircraft that crashed. This was FPL’s biggest project ever. For more details, see the discussion in the Introduction. Sources for this list of pilots and aircraft were the 1976 FPL Annual Report, a preliminary handwritten list, and a typed list dated 19 July 1976, compiled after the completion of the spray season by Don Henry, Operations Coordinator for FPL. The table below is based on the final typed list. FPL again “dry leased” its aircraft from Evergreen Air Services. A total of 38 TBMs were operated in NB during the spray program. TBM teams that flew in New Brunswick in 1976 for the aerial spray program. Red entries indicate aircraft that crashed. 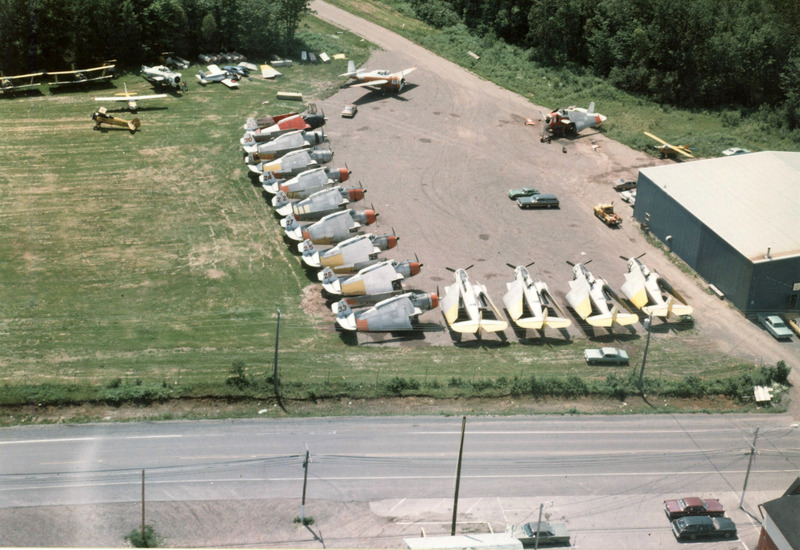 FPL’s fleet of 24 TBMs on display at the Fredericton Airport, 22 June, 1976. The FPL hangar and offices are in the blue building at top left. 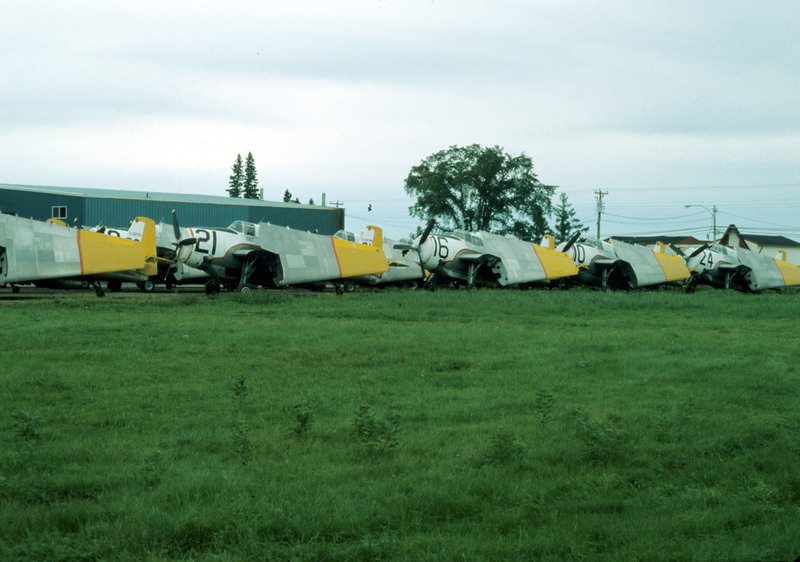 A long row of TBMs at Blissville, May 1976. The other end of the long row of TBMs at Blissville, May 1976. TBMs stored at Fredericton, Fall 1976. Sources for this list of pilots and aircraft were the 1977 FPL Annual Report, a preliminary handwritten list and a typed list. A total of 36 TBMs were operated in NB during the spray program. In early August, an agreement was reached with J.D. Irving Limited’s Woodlands Division whereby FPL would supply one TBM for about 20 hours of flying time to spray herbicide in the Juniper – Boston Brook area. Actual flying time was 15.3 hours. On March 24, Barney W. Flieger died in hospital after a short illness. Mr. Flieger was manager of FPL from its formation in 1952 to his retirement in 1975. TBM teams that flew in New Brunswick in 1977 for the aerial spray program. Red entries indicate aircraft that crashed. 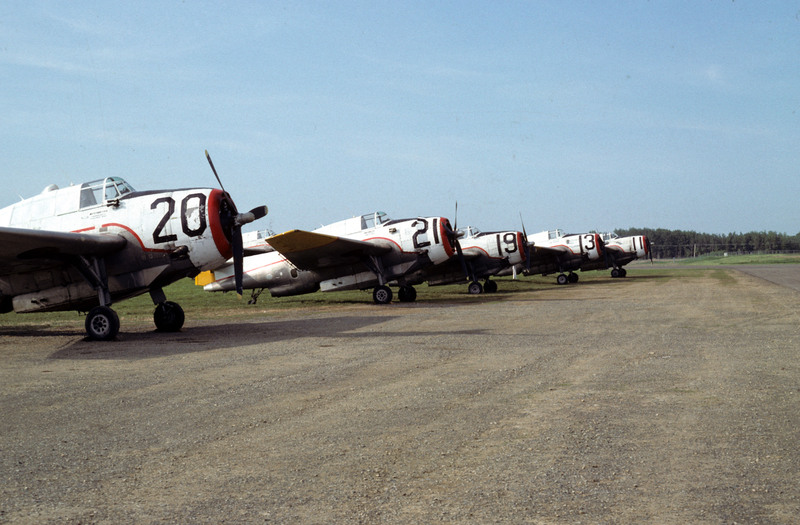 TBM fleet of 13 at Boston Brook airstrip – pits and aircraft parking area, June 1977. Sources for this list of pilots and aircraft were the 1978 FPL Annual Report and a typed and annotated list. A total of 33 TBMs were operated in NB during the spray program. FPL also purchased a Harvard Mark IIA (C-FTSV) to train TBM pilots. One TBM was supplied to Dr. Jules Picot of the University of New Brunswick’s Engineering Department for experimental spray trials out of Blissville airstrip (May 7-13 and July 2-13). One TBM was contracted to J.D. Irving Ltd. to spray herbicide at Boston Brook (July 29 – August 12). Registration Old No. New No. Registration Old No. New No. Registration Old No. New No. GLEN #A14 was not renumbered as it crashed on June 21. FPL was now the proud owner of TBMs numbered 1 to 24. TBMs ready for painting, 1978. Stripping and repainting TBMs at Fredericton, 1978. 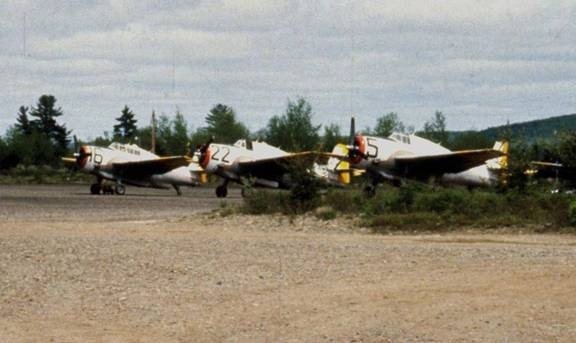 TBM teams that flew in New Brunswick in 1978 for the aerial spray program (old numbers). Red entries indicate aircraft that crashed. Eight TBMs at Blissville, 1978. 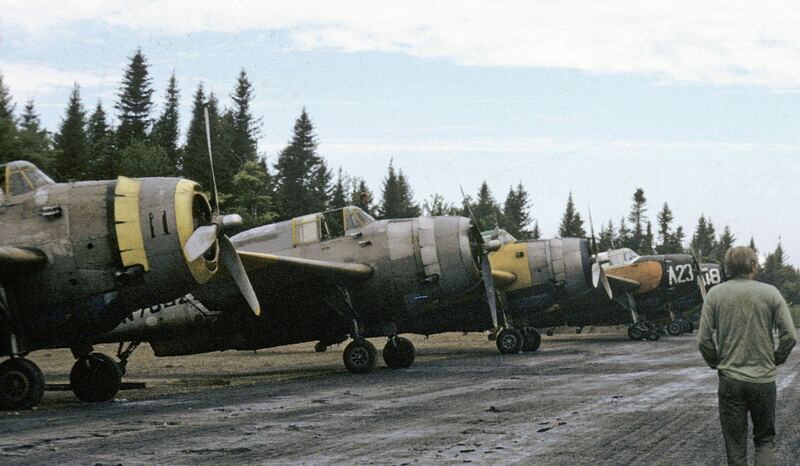 The Firefly team loading: TBM #616 (middle) and #618 FMUE (foreground) and likely #607 FAGN (lead), Boston Brook, June 1978. TBM #15 with others of the team at Boston Brook, 1978: (l to r) #5 FIMN, #15 GFPQ and #7 FAGN. Sources for this list of pilots and aircraft were the 1979 FPL Annual Report and a typed and annotated list (several versions). A total of 30 TBMs were operated in NB during the spray program. GLEL #13 was contracted to J.D. Irving for herbiciding in the Juniper – Boston Brook area during the week of August 20. TBM teams that flew in New Brunswick in 1979 for the aerial spray program. Red entries indicate aircraft that crashed. 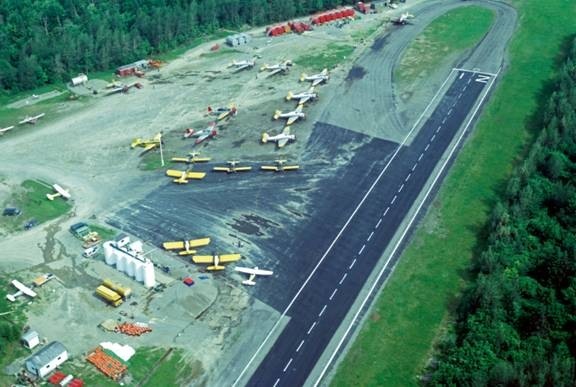 The 22 remaining FPL TBMs on display at the Fredericton Airport, 1979. Firefly Team l to r: #607 (FAGN), #605 (FIMN) and #602 (FIMK), Blissville airstrip, 1979. 18 TBMs at Blissville, 1979. TBMs at stored Fredericton, 1979. A list titled “Team List – 1980”, dated 19 May, is the source for this 1980 assignment list of pilots and teams. A total of 28 TBMs were operated in NB during the spray program. The teams worked out of 4 airstrips: Brockway, Chipman, Boston Brook and Sevogle. TBM teams that flew in New Brunswick in 1980 for the aerial spray program. TBM fleet stored at FPL, 1980. 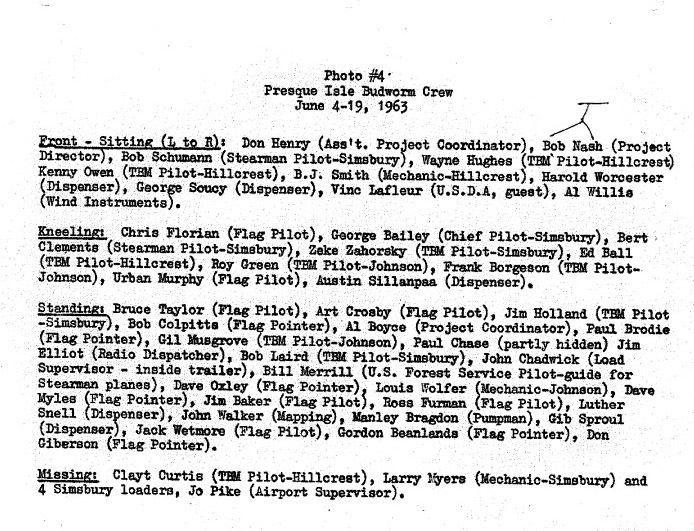 A six-page typed list dated 13 June 1981 is the source for the 1981 list of TBM pilots and teams. A total of 32 TBMs were used in the 1981 spray program, including 4 from the USA, the first US TBMs used in New Brunswick since 1972. These US TBMs were called in this year because of a shortage of Canadian aircraft. The teams worked out of airstrips Brockway, Juniper, Boston Brook, Charlo and Dunphy. TBM teams that flew in New Brunswick in 1981 for the aerial spray program. 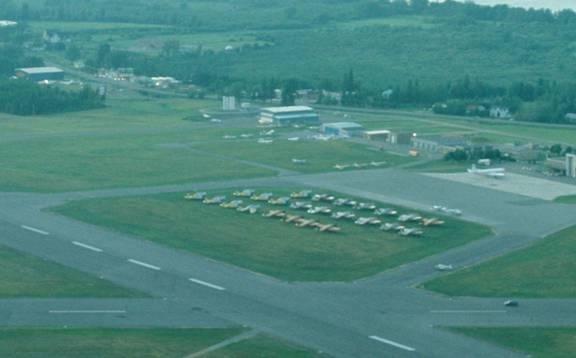 FPL’s fleet of 30 TBMs and other aircraft on display at the Fredericton Airport, 25 June, 1981. Whiskey Team l to r: #15 GFPQ, #7 FAGN, #12 FMUD, and #5 FIMN at Boston Brook, 1981. 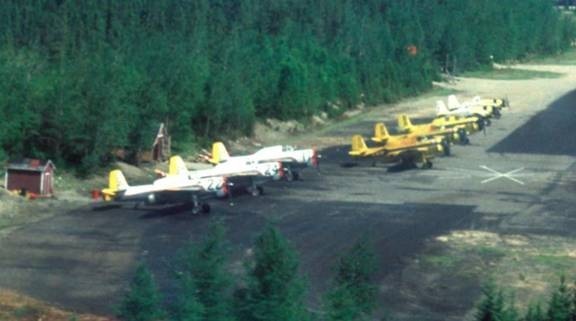 The Donkey team parked at Juniper airstrip, June 1981: (l to r) #22 GFPL, #24 GLEJ and #17 GFPN. The yellow TBMs belong to Norfolk Aviation. TBMs and other aircraft at Boston Brook, June 1981. 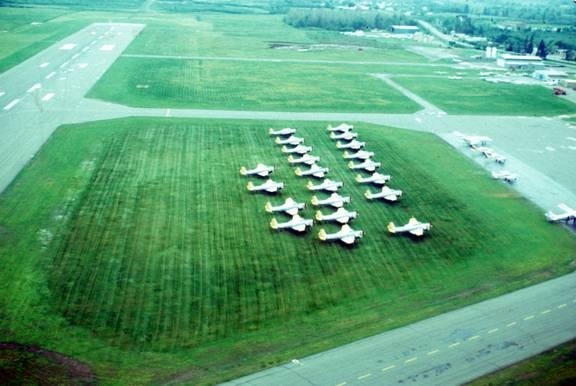 Fleet of 21 TBMs at Fredericton Airport, 1981. TBMs at Charlo Airport, 1981. A five-page typed list dated 14 June 1982 is the source for the 1982 list of TBM pilots and teams. A total of 33 TBMs were used in the 1982 spray program, including 5 from the USA, the first US TBMs used in New Brunswick since 1972. These US TBMs were called in this year because of a shortage of Canadian aircraft. The teams worked out of 6 airstrips: Brockway, Juniper, Boston Brook, Charlo, Sevogle and Dunphy. Two-thirds of the Raccoon Team at Sevogle, 1982: #23 FIMR and #4 GFPR. A six-page typed list dated 6 June 1983 is the source for the 1983 list of TBM pilots and teams. A total of 27 TBMs were used in the 1983 spray program. 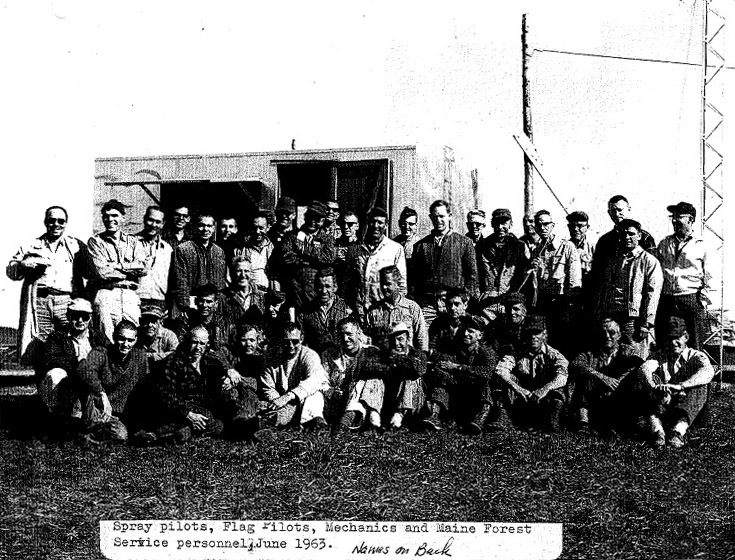 The teams worked out of 6 airstrips: Brockway, Boston Brook, Charlo, Chipman, Sevogle and Dunphy. This was the last year that Norfolk flew TBMs for the spray program in New Brunswick. TBM teams that flew in New Brunswick in 1983 for the aerial spray program. Red entries indicate aircraft that crashed. Brandy Team at Brockway, 1983: #16 FKCM, #22 GFPL and #5 FIMN. The Brandy team at Brockway, 1983. #16 is third from left, and the others are #22 GFPL and #5 FIMN. A four-page typed list dated 25 May 1984 is the source for the 1984 list of TBM pilots and teams. A total of 21 TBMs were used in the 1984 spray program, including two from Hicks and Lawrence of Ontario. This was the last year that FPL contracted TBMs from other companies, and no U.S. TBM’s were needed. The teams worked out of 4 airstrips: Brockway, Boston Brook, Sevogle and Dunphy. TBM teams that flew in New Brunswick in 1984 for the aerial spray program. Red entries indicate aircraft that crashed. Firefly team at Sevogle, 1984, l to r: #2 (FIMK), #1 (FIMI) and #5 (FIMN). A three-page typed list dated 11 June 1985 is the source for the 1985 list of TBM pilots and teams. A total of 12 FPL TBMs were used in the 1985 spray program. The teams worked out of 3 airstrips: Brockway, Boston Brook and Sevogle. This year Forest Protection Limited moved its office across the street to the Evergreen hangar. TBM teams that flew in New Brunswick in 1985 for the aerial spray program. 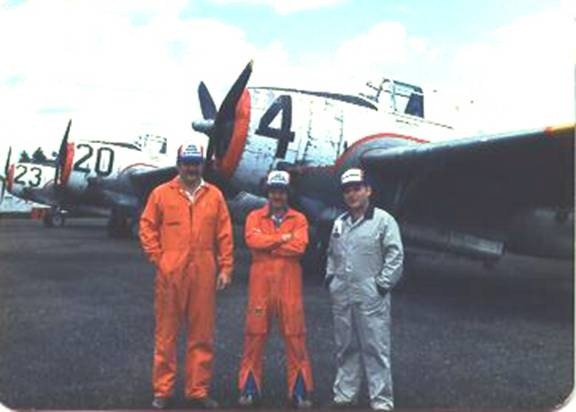 The Brandy team at Brockway, 1985: (l to r) #16 FKCM, #23 FIMR and #22 GFPL. Firefly team at Sevogle, 1985: #24 GLEJ, #4 GFPR and #12 FMUD. TBM #22 and Brandy team in pits, Brockway, 1985. TBMs #20 GLEH and #21 GFPM, part of the Poker team, Boston Brook, 1985. Firefly Team, #4 (GFPR) and #12 (FMUD), and Brandy Team, #3 (GFPS), #13 (GLEL) and #18 (FMUE) parked at Sevogle NB, 1985. A three-page typed list dated 30 May 1986 is the source for the 1986 list of TBM pilots and teams. A total of 9 FPL TBMs were used in the 1986 spray program. The teams worked out of 3 airstrips: Brockway, Boston Brook and Sevogle. TBM teams that flew in New Brunswick in 1986 for the aerial spray program. The Poker team airborne, 1986: #14 GLEK, #21 GFPM and #20 GLEH. An almost perfect formation, probably 1986. A three-page typed list dated 28 May 1987 is the source for the 1987 list of TBM pilots and teams. A total of 9 FPL TBMs were used in the 1988 spray program. The teams worked out of 2 airstrips: Dunphy and Boston Brook. Figure 2. TBMs #12 FMUD and #20 GLEH spraying over woodland, 1987. The cleared area is a recently harvested block. TBM teams that flew in New Brunswick in 1987 for the aerial spray program. Red entries indicate aircraft that crashed. TBMs stored for winter at FPL, Fredericton, 1987. The other TBMs are #20 GLEH (rear), #14 GLEK, #21 GFPM and #18 FMUE. A typed list dated 27 May 1988 is the source for the 1988 list of TBM pilots and teams. A total of 12 FPL TBMs were used in the 1988 spray program. The teams worked out of 2 airstrips: Sevogle and Boston Brook. TBM teams that flew in New Brunswick in 1988 for the aerial spray program. FPL TBM’s on display at the Fredericton International Airport, 1988. A typed list dated 25 May 1989 is the source for the 1989 list of TBM pilots and teams. A total of 12 FPL TBMs were used in the 1989 spray program. The teams worked out of 2 airstrips: Sevogle and Boston Brook. TBM teams that flew in New Brunswick in 1989 for the aerial spray program. A typed list dated 31 May 1990 is the source for the 1990 list of TBM pilots and teams. A total of 12 FPL TBMs were used in the 1990 spray program. The teams worked out of 2 airstrips: Sevogle and Charlo. TBM teams that flew in New Brunswick in 1990 for the aerial spray program. A typed list dated 7 June 1991 is the source for the 1991 list of TBM pilots and teams. A total of 9 FPL TBMs were used in the 1991 spray program, and worked out of several airstrips. TBM teams that flew in New Brunswick in 1991 for the aerial spray program. The Tiger team at Sevogle (? ), June 1991: #14, #21 GFPM, #10 GFPT and #13 GLEL. A typed list is the source for the 1992 list of TBM pilots and teams; the team names were not shown on this list. A total of 7 FPL TBMs were used in the 1992 spray program and worked out of several airstrips. TBM teams that flew in New Brunswick in 1992 for the aerial spray program. The teams were apparently not assigned names this year. A typed list dated 13 May 1993 is the source for the 1993 list of TBM pilots and teams. Three FPL TBMs were used in the 1993 spray program (based at Sevogle airstrip). This was the last year that TBMs were used for aerial insect control in NB. 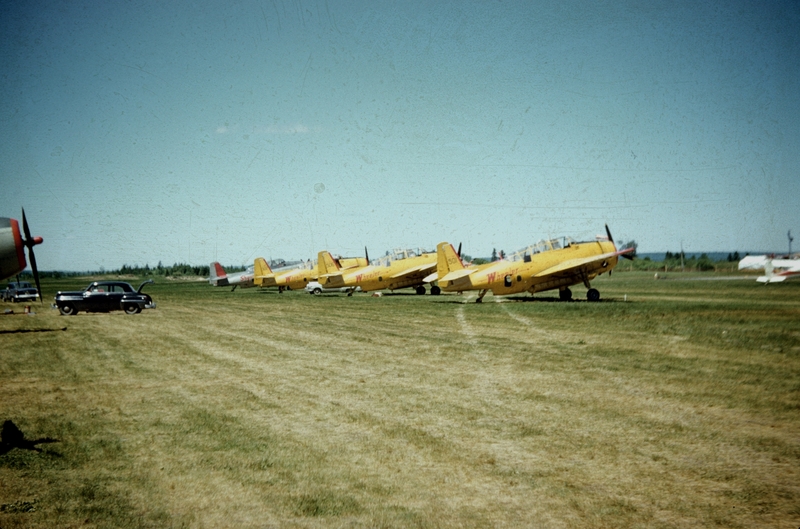 TBM teams that flew in New Brunswick in 1993 for the aerial spray program. An article from The Time-Transcript (Moncton, NB) dated 13 October 1992 states that the old Avengers are still effective and air-worthy. This website certainly brings back the sounds and smells of this extraordinary flying circus which was the budworm project. Congratulations to whoever has had the time to spend compiling this record. However, before anyone else comes up bristling with indignation about an error in your records, may I humbly submit a slight correction for the year 1971. My great friend Orrin Carr was no. 2 in N68663, which was no. 28. 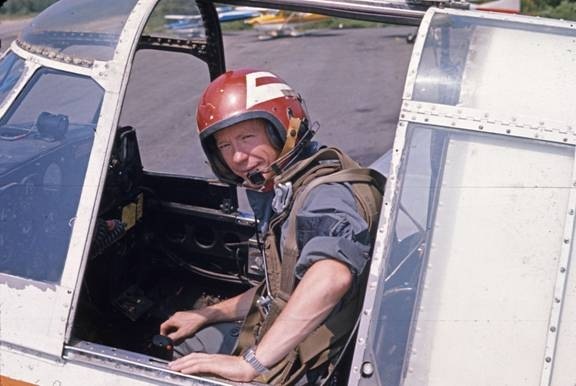 It was, in fact, ex USN pilot, Jerry Sward who crashed into the swamp in No. 26, 90787. For anyone interested, enclosed is my description of this incident extracted from my upcoming book, as yet untitled, which includes 3 seasons of my participation in this hair-raising adventure. “On the eighteenth of June, we were assigned to spray a considerable stretch of woods terminating at the edge of the army property which promised at least five hours of work. We flew to the starting point where I took up station under the lead planes with Orrin formating in echelon on my right as number two, and Jerry outside of him as number three. The end of our swath was clearly defined by a swamp, where I made a forty-five degree flat turn to the right followed by a hard left turn to the reciprocal of the previous heading to line up on the lead planes which had made the turn above us, while my wingmen each stepped up a hundred feet to stay out of the slipstreams, then elegantly descended back into formation, turning the booms on as each crossed the tree line. As I looked over my left shoulder I saw Jerry, his airplane spewing smoke, making a bee-line for the swamp. I pulled up in a hard left turn in time to watch the airplane disappear almost to the wingtips in a spume of flying mud and grass which, subsiding as the machine slowed, revealed the pilot in the process of exiting the cockpit, timing his egress on to the wing to coincide perfectly with the stoppage of forward motion. The only gesture needed to cap this performance was for Jerry, after a dramatic pause, to take a deliberately slow and exaggerated bow. After broadcasting Mayday on the guard channel and requesting a helicopter, the pointer planes remained in orbit over the crash site while Orrin and I returned to Blissville, picked up Mac, and drove to the base hospital where we knew Jerry would be delivered by the chopper. It wasn’t long before he was released. He was unscathed, and my picture of him in the parking lot shows him standing bespattered with drying mud from head to foot as he lifts his gaze gratefully to the sky in acknowledgment of Providence’s benign participation. Wow, what a story, George. I will make the correction in due time. Rambling is good, Dale. Thanks for posting. My dad was Ray Greene, pilot (A11) of the Billy Goat group during the 60’s and 70’s. Thank you for maintaining this page so I can read the history of the TBM’s in Canada. You are very welcome, James. What is the history of Lac des Loups airstrip in Parc la Verendrye in Quebec? Having posted something on the “Spruce Budworm Pilots and Aircraft ————-” section, early this month. I suggested that anyone who flew – or was otherwise involved – on the ’65 Stearman operation, in NB and QB, might like to respond. I can’t imagine why my entry hasn’t generated an answer, as my fond memories of the places and people just don’t seem that old. Maybe fifty years is a long time. Hello I am trying to locate a pilot by the name of Bert Archer. He once worked with my father and I on a mission to try to reconnect them….any information would be appreciated….anything that would help me with my search. Thank you! Hi Tanya, I posted your comment on the FB site FPL Alumni, https://www.facebook.com/groups/18207657968/. Maybe someone will respond. Hello Tanya, I am a bit skeptical that this information will help you in any way, however, my husband (Harold Hawes) and I were at a fairground in Central Ontario (Elmvale, I believe) around the year 1992. As we were strolling around, Harold recognized Bert who was also there and stopped to chat. I believe they had not seen each other since the spray program in the late 60’s so they had a lot to catch up on. It was the one and only time I had ever met Bert myself and we never connected with him again. I believe he said he was living somewhere in that area at that time… A lot of changes can occur in 22 years of course so as mentioned, this info may be of no use to you since it was so long ago. Good luck with your search. I am Bert Archers granddaughter. I am sad to inform you he passed away June 18th, 2016. I am looking for photos of him in his younger years. If you have any, if you could please email them to me at guardianemily@gmail.com it would greatly be appreciated. Thank you.